LONG before Green Acres, the television show, there was Granby's Green Acres, the radio show. GRANBY'S GREEN ACRES, situation comedy. Broadcast History: July 3 - August 21, 1950, CBS. 30m, Mondays at 9:30. Cast: Gale Gordon and Bea Benaderet as John and Martha Granby, ex-bank teller and wife who moved to the country to become farmers. Louise Erickson as Janice, their daughter. Parley Baer as Eb, the hired hand. Announcer: Bob LeMond Music: Opie Cates Writer-Producer-Director: Jay Sommers. Granby's Green Acres grew out of characters played by Gale Gordon and Bea Benaderet on the Lucille Ball series My Favorite Husband. The names were changed, but the basic characters remained the same. Below you'll find four very funny episodes of the radio show that started it all. Some of the differences, from the television show, are very interesting. The Granby's have a daughter who begins dating the county agent. Mr Granby spends a lot of time in the town's general store, run by the absent minded Mr. Kimball. And the Granby's have a OLD farm hand named Eb. I guarantee you'll enjoy these peices of memorabilia, and you'll even find that some aspects of the plots of these episodes later turned up on the television show. ESPECIALLY humorous are the serious commercials touting the greatness of the United States...very patriotic! 10362. Granby's Green Acres. March 30, 1950. CBS net. Sustaining. The first show of the series. Mr. Granby quits his bank job and is determined to grow his own food on his own farm. 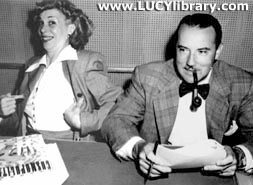 Gale Gordon, Bea Benaderet, Parley Baer. 1/2 hour. Audio condition: Excellent. Complete. 10363. Granby's Green Acres. July 10, 1950. CBS net. "Granby Plants A Crop". Sustaining. What to plant? Corn? Wheat? Parley Baer, Louise Erickson, Jay Sommers (writer, director), Jack Harvey (writer), Opie Cates (composer, conductor), Gale Gordon, Bea Benaderet, Bob Lemond (announcer). 29:46. Audio condition: Excellent. Complete. 10364. Granby's Green Acres. July 17, 1950. CBS net. "Mr. Granby Discovers Electricity". Sustaining. Granby decides an electric milker is needed for his farm. The announcer (possibly Johnny Jacobs) almost gives the wrong system cue. Gale Gordon, Bea Benaderet, Parley Baer, Louise Erickson, Horace Murphy, Herb Vigran, Jay Summers (writer, director), Jack Harvey (writer), Dave Swift (writer), Opie Cates (composer, conductor), Johnny Jacobs (announcer ?). 29:48. Audio condition: Excellent. Complete. 10365. Granby's Green Acres. July 24, 1950. CBS net. "Mr. Granby Fights The Love Bug". Sustaining. Granby's corn is doing poorly, but he won't listen to the county agent's advice. Gale Gordon, Bea Benaderet, Parley Baer, Opie Cates (composer, conductor), Louise Erickson, Horace Murphy, Rye Billsbury, Jay Summers (writer, director), Jack Harvey (writer), Dave Swift (writer), Johnny Jacobs (announcer). 29:33. Audio condition: Excellent. Complete. 10366. Granby's Green Acres. July 31, 1950. CBS net. "Mr. Granby Lays An Egg". Sustaining. The farm need chickens, so Granby buys two hundred of them, all roosters! Gale Gordon, Bea Benaderet, Parley Baer, Louise Erickson, Horace Murphy, Rye Billsbury, Jay Sommers (writer, director), Jack Harvey (writer), Dave Swift (writer), Opie Cates (composer, conductor), Johnny Jacobs (announcer). 29:43. Audio condition: Excellent. Complete. 66305. Granby's Green Acres. August 21, 1950. CBS net. "Mr. Granby Breaks Down". Sustaining. Granby becomes very sensitive to noise. The sequence makes excellent use of sound effects. The last show of the series. Gale Gordon, Bea Benaderet, Louise Erickson, Rye Billsbury, Opie Cates (composer, conductor), Parley Baer, Hans Conried, Horace Murphy, Gail Bonney, Billy Gould (sound effects), Jay Sommers (writer, director), Jack Harvey (writer), Bob Shoe (assistant director), Ray Ehrlenborn (sound effects), Pat Walsh (engineer), Bob Lemond (announcer). 29:48. Audio condition: Excellent. Complete. Fortunately for the radio show when it transitioned to television, there were no lawsuits and no personal injury attorneys were hired. It was smooth transition over from radio to television.